Today dozens of archaeologists at Luxor Inspectorate went on a strike in protest at the last decision taken by Ministry of State for Antiquities Ahmed Eissa before leaving office. The minister ordered Luxor antiquities director Mansour Breik removed from his post a few hours before leaving the ministry for good amid the toppling of president Mohamed Morsi. Employees of the Ministry of State for Antiquities (MSA) describe the decision as "arbitrary and unjustified." A curator at the MSA told Ahram Online on condition of anonymith that the decision reflected an old dispute between Breik and Eissa since the ministry was the Supreme Council of Antiquities (SCA). Sarwat Arabi, head of the Luxor Chamber of Tourism, said that the tourism section rejects the decision, saying Breik exerts great efforts to efficiently collaborate with all agencies and authorities in Luxor governorate to protect antiquities and promote tourism. Poet Hussein Kabahi, organiser of the Luxor Intellectual Union, believes Eissa replaced Briek on political grounds. Eissa is a member of Al-Wasat Party — a moderate Islamist group. Archaeologists protesting are asking for the return of Breik, especially that the post is now empty after Morsi's ouster. This is very sad news to me. 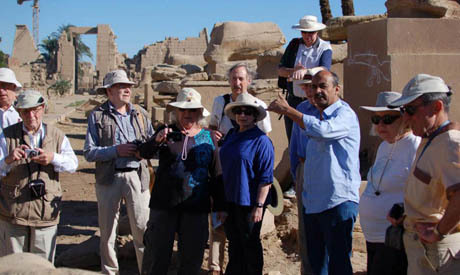 Dr. Boraik is a very good man and contributes an enormous amount to the heritage of Egypt. I want to see him again at the lectures. Something has to be done to protect the jobs of men like Dr.Boraik. If he goes he will be sadly missed. What can we do? This was clearly a political decision and Mansoor Breik should be reinstated immediately. He is well known for the high standard of his work and care for the monuments.